On their second stop in France, Euronews' road trip team visited the town of Narbonne in the country's south. 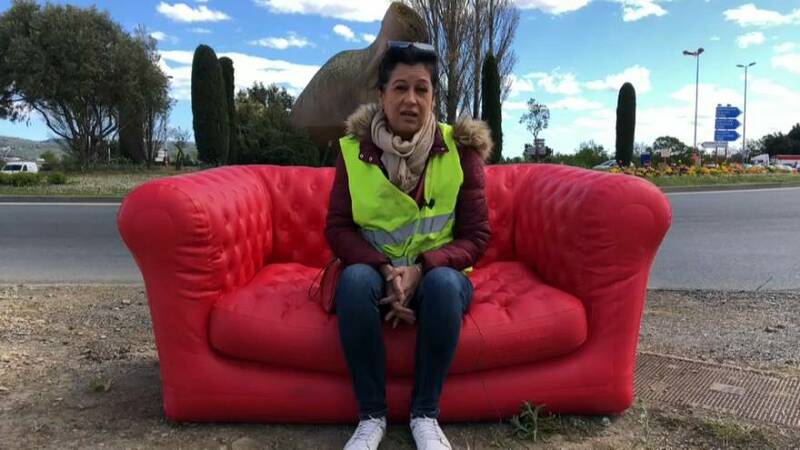 There, they set up the inflatable red sofa and invited local Gilets Jaunes (Yellow Vests) protesters to sit and tell their side of the story. Sylvie, 47, has been involved with the movement since it first started in November 2018. "Life has become too expensive," Sylvie said. "This touches all the people. It touches everybody." The movement began as a protest against the rise in fuel prices, but has since evolved to include other issues that affect the people of France. A major concern among protesters is the cost of living. "I find it unacceptable that nowadays we’re not able to live with our income," said 56-year-old Beatrice. "There are people that live in places you would not put your dog," said 68-year-old William. Laly, another yellow vest, said that it has become impossible to make ends meet. "I make €480 from RSA (benefits). With that I have to pay my EDF electricity bill, which I just received, €162. I have also just received my water bill from Veolia, thank you, €170," she said. "Count it all up. I’m left with €50 for four weeks. To live, to eat." Despite attempts by the French government to stop the movement, it is ongoing. "Inevitably, if it continues they will have to get organised," William said. "They will have to create a political movement like the ones in Italy or Spain. It will happen." "I hope they do. Because, unfortunately, without politics nobody listens, nobody speaks to you. They will have to enter this rotten world." But, not all yellow vests believe that becoming involved in politics is the right solution. "It’s an apolitical movement. We don’t want to enter politics," said Sylvie. "A yellow vest political party? No. Me personally I would never vote for the yellow vests," said Beatrice.